Location: PMKI > Project Controls and Scheduling > Scheduling Good Practice. This subject focuses on core scheduling practice and looks at what makes a good schedule, what makes a good planner, and what should they do; the ‘good practices’ needed to create and manage an effective schedule. These are substantial papers focusing on core aspects of our profession. The disastrous state of schedule practice in the construction industry is detailed in the report Managing the Risk of Delayed Completion in the 21st Century [or download the smaller executive summary]. Between December 2007 and January 2008, The Chartered Institute of Building (CIOB) conducted a survey of the construction industry’s knowledge and experience of different methods of project control, and time management, record keeping, monitoring and training. The findings suggested there was a lot of work needed to achieve general 'best practice'. We definitely expect to see the management of 'time risks' improved from this work and the comparable efforts being lead by Planning Planet and the publication of 'The Practice Standard for Scheduling' by PMI was only the beginning! Effective project scheduling is critical to the success of a project. PMI's The Practice Standard for Scheduling is a systematic guide describing the hallmarks of an effective scheduling methodology, as well as providing quantifiable means for assessing the maturity of a schedule model. 5 - Conformance Index and Conformance Scoring in Appx D and E.
Without effective time management there can be no effective resource management, cost management or delay management. The primary purpose of this Guide is to set down the standards necessary to facilitate the effective and competent management of time in complex projects. It defines the standards by which project schedules will be prepared, quality controlled, updated, reviewed and revised in practice and describes the standards of performance which should reasonably be required of a project scheduler. The Guide has been developed as a scheduling reference document capable of wide application. It is a practical treatise on the processes to be followed and standards to be achieved in effective management of time. It can be used in any jurisdiction, under any form of contract, with any type of project and should be identified as the required standard for the preparation and updating of contract programs, progress reporting and time management. The concepts contained in The Guide are implemented by the CIOB Complex Projects Contract; see more on the contract. GAO Schedule Assessment Guide: Best Practices for Project Schedules - GAO-16-89G: Published: 22nd December 2015. This schedule guide is a companion to the GAO Cost Estimating and Assessment Guide. 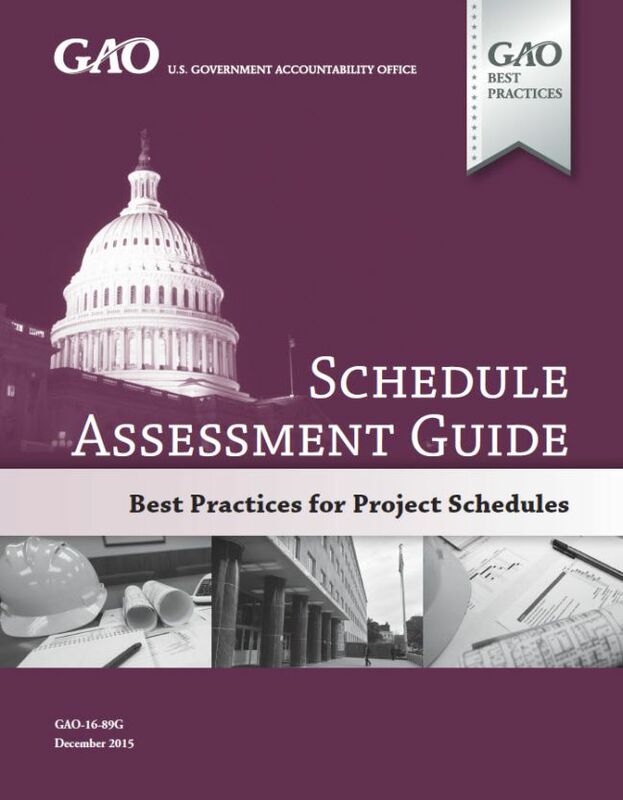 The Schedule Assessment Guide and Cost Guide, together offer a consistent methodology for developing, managing, and evaluating capital program cost estimates includes the concept of scheduling the necessary work to a timeline. Simply put, schedule variances are usually followed by cost variances. Because some program costs such as labor, supervision, rented equipment, and facilities cost more if the program takes longer, a reliable schedule can contribute to an understanding of the cost impact if the program does not finish on time. In addition, management tends to respond to schedule delays by adding more resources or authorizing overtime. Further, a schedule risk analysis allows for program management to account for the cost effects of schedule slippage when developing the life-cycle cost estimate. A cost estimate cannot be considered credible if it does not account for the cost effects of schedule slippage. * The need for effective planning ahead of scheduling and the different objective of these two processes. * The concept of ‘schedule density’ and the need to schedule at an appropriate level of detail based on the contemporary knowledge available to the project team. * The need for on-going dynamic scheduling to manage time. * The need to contemporaneously assess the impact of delaying events in real time based on accurate and current schedules to allow effective mitigation. Henry L. Gantt - A Retrospective view of his work - This paper describes the important contributions made by Henry Gantt to modern management and defines what a 'Gantt Chart' really is. What the modern worked calls a 'Gantt Charts' pre-dates Gantt by more than a century. A second paper looks at the potential source of the misuse of term Gantt Chart. [View Abstract]. Should your schedulers be certified? - This paper focuses on initiatives to revitalise our industry by creating a career path for planners and schedulers as well as clearly identifying the benefits of certification for organisations that employ planners and schedulers. New initiatives by the CIOB and Planning Planet are designed to deliver a career framework for professional ‘Time Managers’, taking people from novice, to a practitioner skilled in the art of planning and scheduling. [View Abstract]. See also: The problem with CPM. The ‘5 Steps To Ensure Project Success’ methodology is a proven process designed to focus the thinking of key Stakeholders onto the parameters required to achieve a successful project outcome. It uses the development of the schedule as a central plank in its approach to developing an effective project team and fostering positive stakeholder involvement. The process is designed as a logical sequence of activities (and importantly, agreements) but recognises iterative passes through some of the key steps may be required to achieve agreement. The 5–STEPS methodology requires each step to be completed, validated and "signed off" before moving onto the next. 5-STEPS is supportive of, and recognises the overall structure of the PMBOK, but focuses on activities in the key Planning and Controlling ‘process groups’ to develop a realistic schedule and then managing it through to a successful conclusion.